The US on Tuesday expressed concern over "credible" reports of harassment, intimidation, violence and alleged irregularities in the recently concluded parliamentary elections and urged the country's election commission to work constructively with all sides to address the claims of irregularities. Prime Minister Sheikh Hasina's Awami League and its allies won the general elections on Sunday, bagging 288 of the total 299 seats which went to the polls. The Bangladesh Nationalist Party (BNP) of the jailed ex-premier Khalida Zia won five seats in the 300-member Parliament. 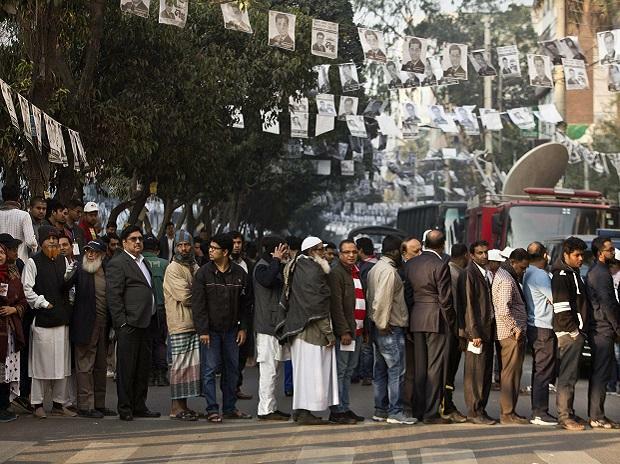 "The US commends the tens of millions of Bangladeshis who voted in Bangladesh's 11th parliamentary election on December 30, 2018, as well as the decision of all major opposition political parties to participate, a positive development after the boycotted election of 2014," State Department Deputy Spokesperson Robert Palladino said. The Trump administration, in its first reaction to the December 30 parliamentary poll results in Bangladesh, said that the US remains deeply invested in the future of Bangladesh and its democratic development. The election was marred by violence, in which 17 people died. The opposition BNP rejected the poll outcome as "farcical" and rigged and demanded fresh election, amid allegations of intimidation. The opposition Jatiya Oikya Front - National Unity Front (NUF) - comprising the BNP and some smaller parties, criticised the EC and accused its chief of being biased. Palladino asserted that the US was the Bangladesh's largest foreign investor, largest single-country market for Bangladeshi exports, and a home to a large community of Americans of Bangladeshi origin. "In this light, we note with concern credible reports of harassment, intimidation and violence in the pre-election period that made it difficult for many opposition candidates and their supporters to meet, hold rallies, and campaign freely," Palladino said. Expressing concern that election-day irregularities prevented some people from voting, he said this undermined faith in the electoral process. "We strongly encourage all parties to refrain from violence and request the Election Commission work constructively with all sides to address claims of irregularities," Palladino said. "Bangladesh's impressive record of economic development and respect for democracy and human rights are mutually reinforcing, and we look forward to continue working with the ruling government and opposition towards advancing these interrelated goals," the State Department spokesperson said.